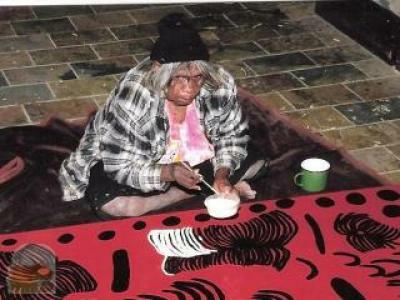 Nancy Gibson Napanangka began painting in the early 1980s. She paints traditional stories associated with her country, reflects upon various food sources, or uses of the natural flora in the area such as the Dogwood Tree - a species of acacia that grows along the creek beds. Nancy also paints Mina Mina Dreaming, a Dreaming that she shares with such artists as Judy Watson Napangardi and Dorothy Napangardi. The Napangardi and Napanangka women and Japangardi and Japanangka men are all custodians of the Dreaming ancestors that created this area. Nancy and Judy Watson’s styles are visibly similar in their shared use of bright colour and bold representations. Mina Mina is one of the most extensive and significant Women’s Dreamings belonging to the Warlpiri people. Paintings by Nancy specifically depict a time during the creation era when a group of ancestral women of all ages travelled to the east collecting bush foods.